Move the cursor to the Date field of the next empty row of the register (if it isn’t already there) and type the date. Use MM/DD format. You enter August 31, 2015, for example, as 8/31. As with check dates, you have to enter the year only if the current year number, which Quicken retrieves from the little clock inside your computer, is wrong. 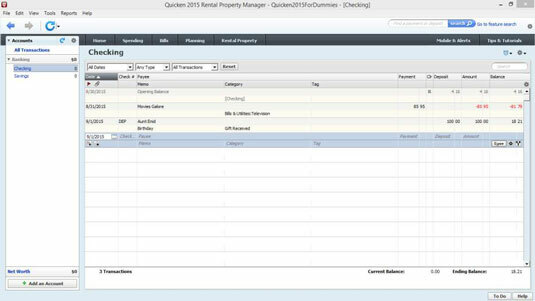 You can adjust the date in a Date field in Quicken by using the + and – keys. The + key adds one day to the current date; the – key subtracts one day from the current date. Type the code DEP (for deposit) in the Check Number field. Are you the meticulous type? Then go ahead and move the cursor to the Check Number field. Open the Num drop-down list box and select Deposit. Type the name of the person from whom you received the deposit. (Optional) Enter a memo description. Move the cursor to the Memo field and describe something, such as the reason for the deposit. Aunt Enid’s money may be described as birthday gift. If you’re a business depositing a customer’s check, use this entry to identify the invoice the customer is paying. You know how this works by now. Move the cursor to the Category field. Open the Category drop-down list box, if necessary, and select the appropriate category. Alternatively, if you like living on the edge, try typing the category name. You might describe Aunt Enid’s check as Gift Received. To add a category, type a name in the Category field and move to another field. When Quicken doesn’t recognize the category name, it asks you whether you want to add the category. Click Yes, and Quicken displays the Set Up Category dialog box. If you’re tagging transactions because categories don’t provide you enough detail about transactions, enter a tag in the Tag box. This command tells Quicken that you want to record the transaction in your register. Quicken beeps in protest but then adds the transaction. The figure shows the Checking register (in the Two-Line Display format) after you enter Aunt Enid’s thoughtful gift. Maybe before you go any further, you should call Aunt Enid to thank her. See the ending balance given at the bottom in the register window? The Ending Balance shows the account balance after every register transaction. If you enter future-dated transactions, the register window shows both a current balance — the balance as of the current date — and an ending balance, which is the balance after all the transactions. Quicken also includes a Paycheck Setup Wizard that you can use to describe the taxes withheld from your paycheck and categorize the deductions from your paycheck. That much said, you probably don’t need to keep track of these amounts unless, for some reason, you want precise estimates of the income taxes you pay. Remember that your employer already does this accounting. Also remember that you must use the employer’s data, which appears on your W-2 form — and not your Quicken data — when you prepare your U.S. taxes. If you do decide to use the Paycheck Wizard, click the Planning tab, the Tax Center button, and then the Add Paycheck button. When Quicken displays the Paycheck Setup dialog box, use its buttons and boxes to describe your payroll check and any deductions. Note that you may need to scroll down the Tax Center tab to see the Add Paycheck button. The button appears at the bottom of the tab.